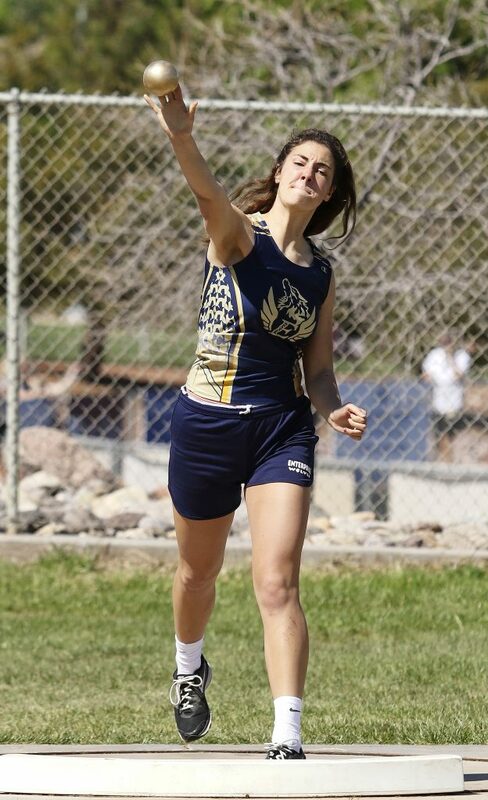 ST. GEORGE — The Desert Hills girls and boys track teams were the runaway winners at their home track meet Friday and Saturday. 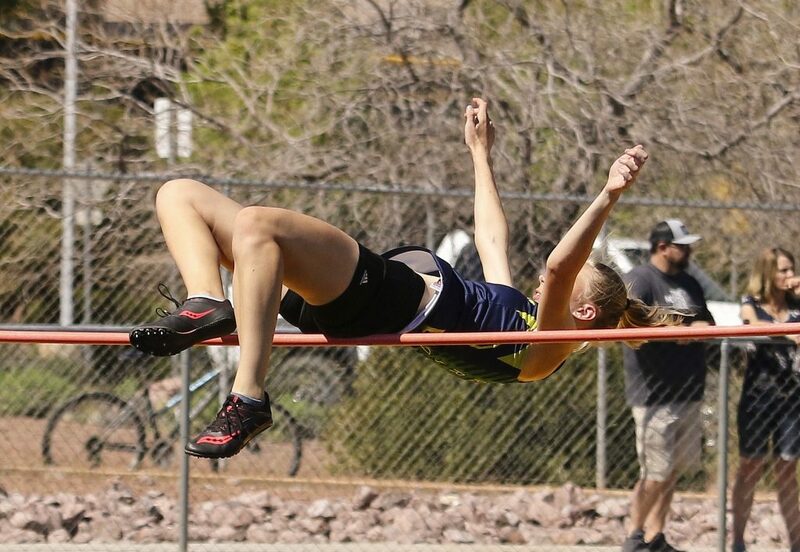 “It was an incredible meet,” said Desert Hills girls coach Logan Fielding, who predicted that Region 9 athletes will dominate the 4A classification at the state meet next month. 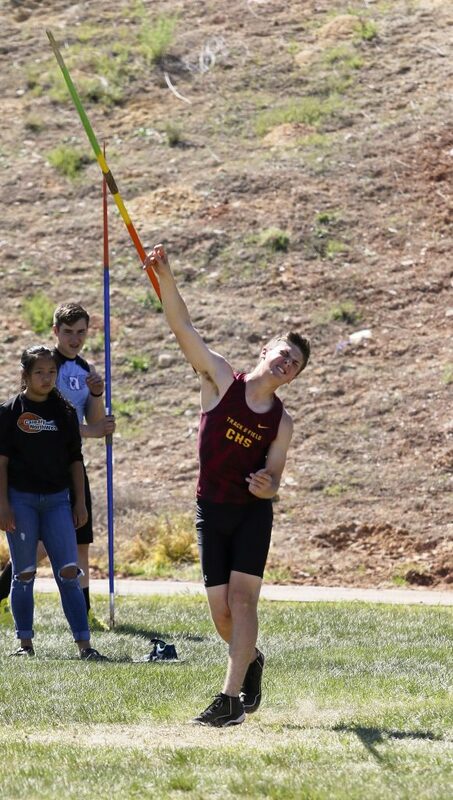 Several meet records were set at the two-day Desert Hills Invitational, which attracted 20 schools, including all seven Region 9 teams and several other schools from Southwest Utah and other parts of the state. The Lady Thunder scored a total of 137 points at the meet, while second-place Lone Peak had 83 and third-place Hurricane had 57. See listings of top 10 team scores at bottom of story. The Desert Hills boys won their meet in similarly convincing fashion, with the Thunder’s 123 points putting them comfortably ahead of runner-up Pine View’s 69 points. Dixie scored 64 and Canyon View scored 61 to take third and fourth place, respectively. 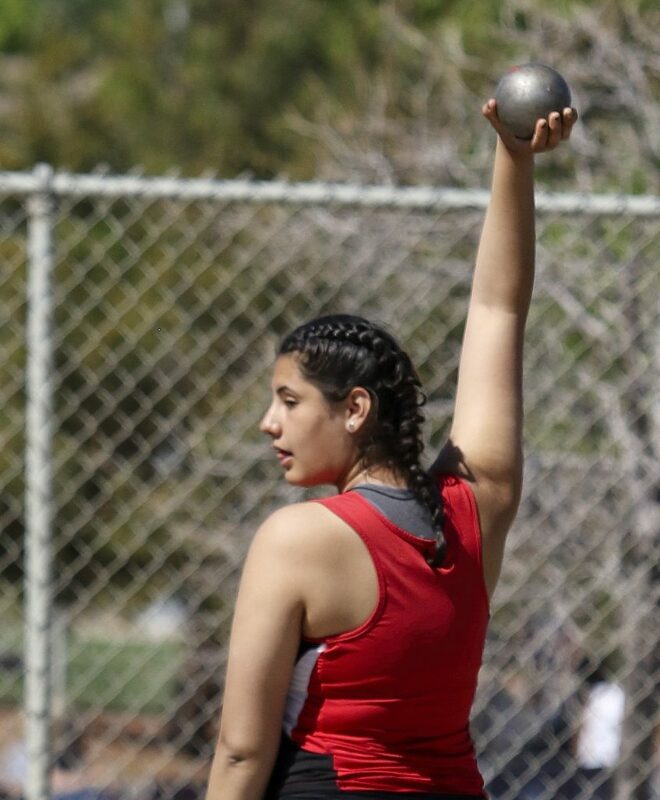 Following are a few of the top performances by Southern Utah athletes at the meet. For complete results click here. Bailey Brinkerhoff of Desert Hills won the 1,600 meter race in 5:03.24, a new personal best and school record, and also the second-fastest time in the 4A this season. Brinkerhoff also placed third in the 800-meter run with a time of 2:18.84, which was faster than the previous meet record. Sophomore Alli Baker of Pine View was second in the 1,600 meters with a time of 5:07.63. In addition, Baker won the 3,200 meter race in 11:27.10. Chloe Taylor and Jenna Welch of Desert Hills took the top two spots in the 100-meter hurdles, with Taylor winning in 15.09 and Welch placing second in 15.41. 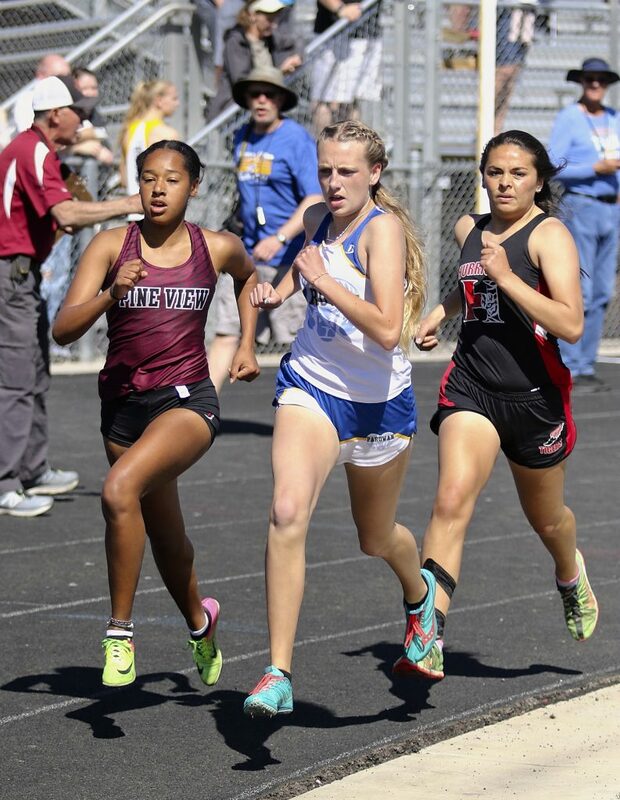 Taylor also won the 300-meter hurdles in a time of 44.06 seconds, which is the best time in that race across all classifications statewide this season, coach Fielding told St. George News. Mylee Moon of Hurricane took second in the 300 hurdles with a time of 45.06, while Welch of Desert Hills was third in 45.11. 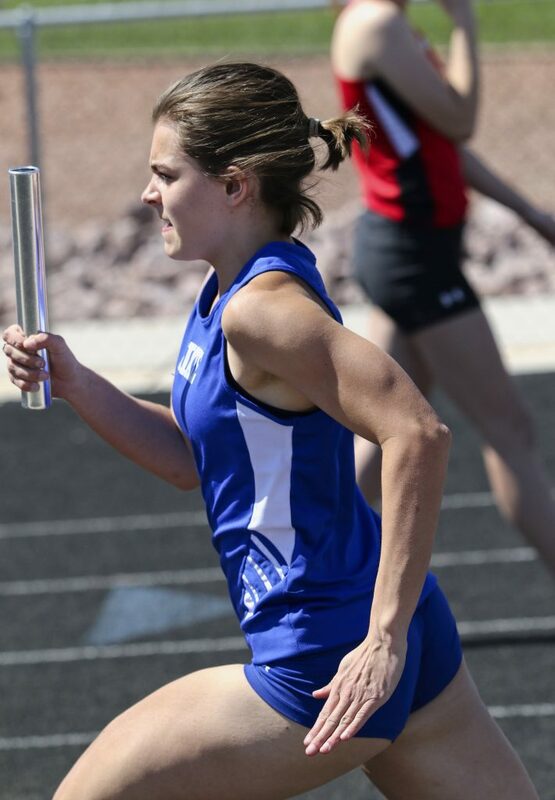 Lina Biasi, a sophomore from Parowan, won the 100-meter dash in a time of 12.87 seconds. Larissa Dabb of Canyon View took second in the 200-meter dash, clocking in at 26.31. The Desert Hills girls won the sprint medley relay in a time of 4:19.23, the best mark in the state in all classifications. Running that race were Rachel Myers and Kennedy Peck with the 200 legs, Emma Jacobsen with the 400 and Trinity Schimbeck with the 800. The Lady Thunder also won the 4×100 meter relay, with Peck, Kiki Stewart, Taylor and Myers finishing in a combined time of 50.01, the current best among 4A teams in the state. Canyon View’s girls won the 4×400 meter relay in a time of 4:06.15. 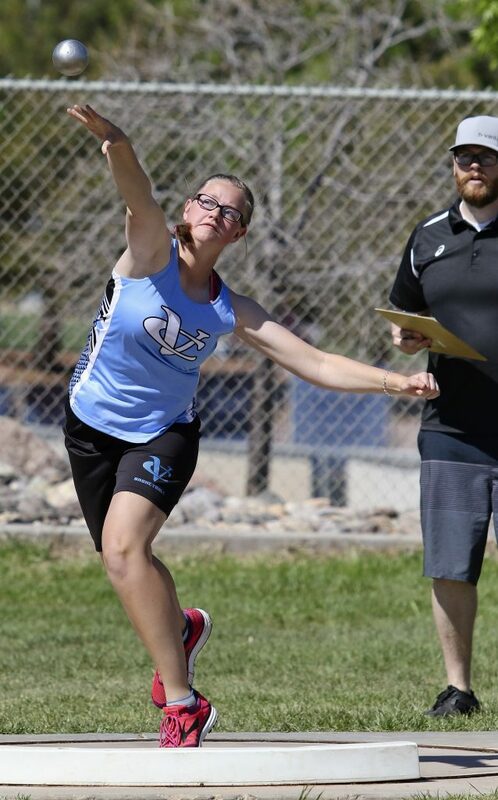 In field events, senior Abby Monson of Desert Hills won the discus event with a top throw measuring 121 feet, 6.5 inches, a new meet record and the third-best throw in the state this season. Monson also won the shot put with a throw of 34 feet, 8 inches. 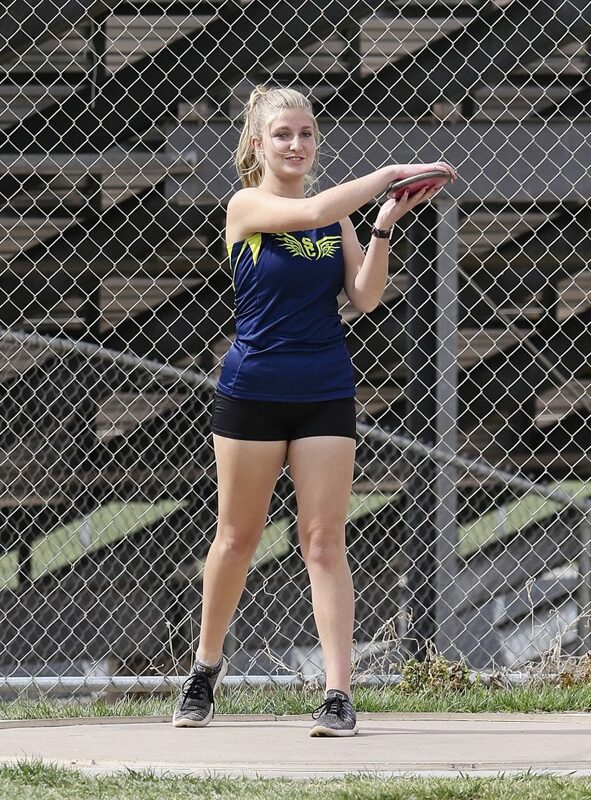 Senior Emilee Nelson of Dixie won the javelin event with a throw of 120 feet, 3 inches, second best among 4A girls this season. 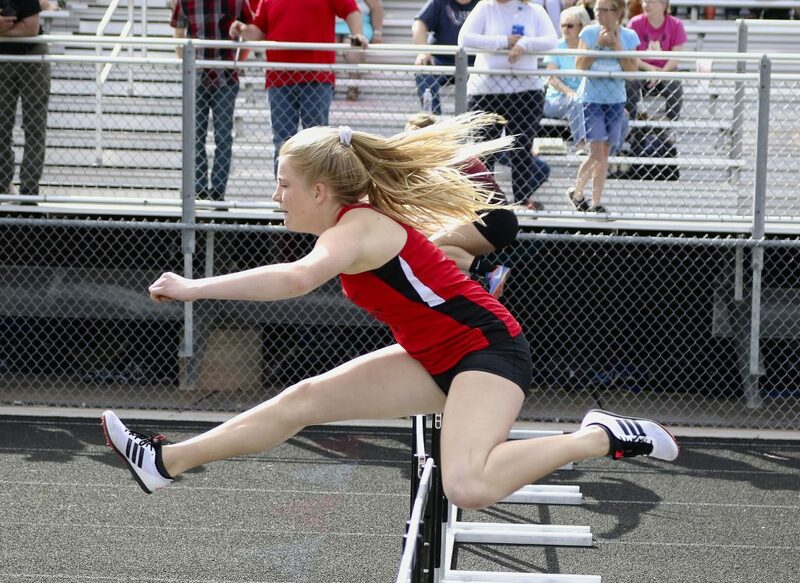 Basketball standout Mayci Torgerson of Cedar won the long jump with a leap measuring 16 feet, 4.5 inches. 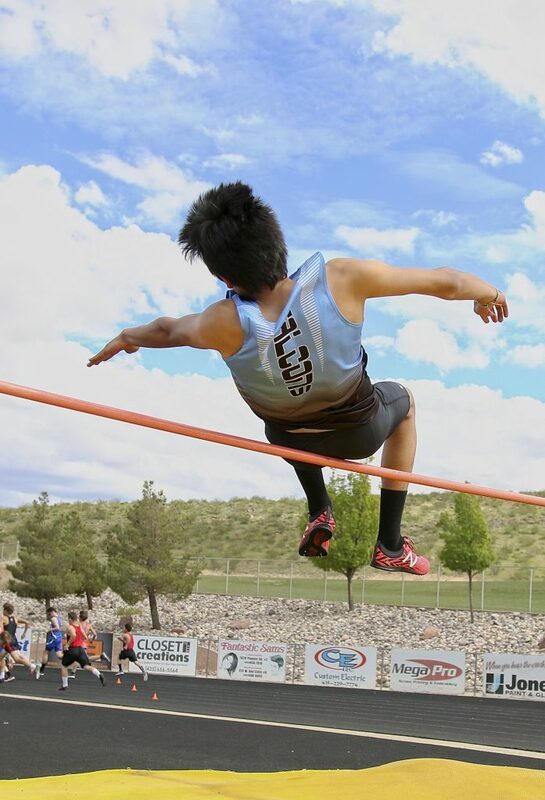 Welch of Desert Hills was a close second, jumping 16 feet, 1 inch. Winning the girls high jump was junior Lexie Leavitt of Snow Canyon, who cleared 5 feet even. Meanwhile, for the boys, senior Easton Brandt of Canyon View won the 1,600 meter run in 4:24.40. He also won the 3,200 meter race in a time of 9:44.11. Taking second in the latter event was Pine View’s Cooper Despain, who finished just a half-second behind Brandt, with a time of 9:44.63. 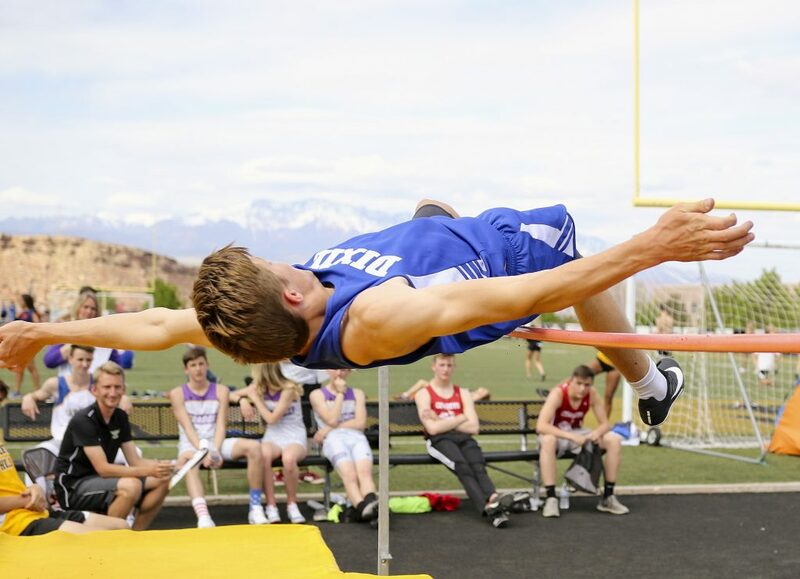 Sophomore Spencer Carlile of Dixie won the 110-meter hurdles in a time of 15.34, while junior Kire Goulding of Desert Hills took second in 15.79. Kanyon Lamb of Panguitch was third in 15.98. Carlile also won the 300-meter hurdles, posting a time of 40.62, while Goulding placed second in 40.80. Pine View’s two freshmen sprinters, Marcus and Dominique Mckenzie, took first and second, respectively, in the 100-meter dash. Marcus finished in 11.06, while his twin brother Dom clocked in at 11.12. Third place went to Desert Hills senior Braden Squires at 11.26, while sophomore Sherm Jensen of Pine View finished fourth with a time of 11.29. Those times represent four of the top five 4A times in the 100 meter dash this season. Squires also won the 200-meter dash in a time of 22.80 seconds, while Snow Canyon sophomore Keilen Washington placed second in 23.18. 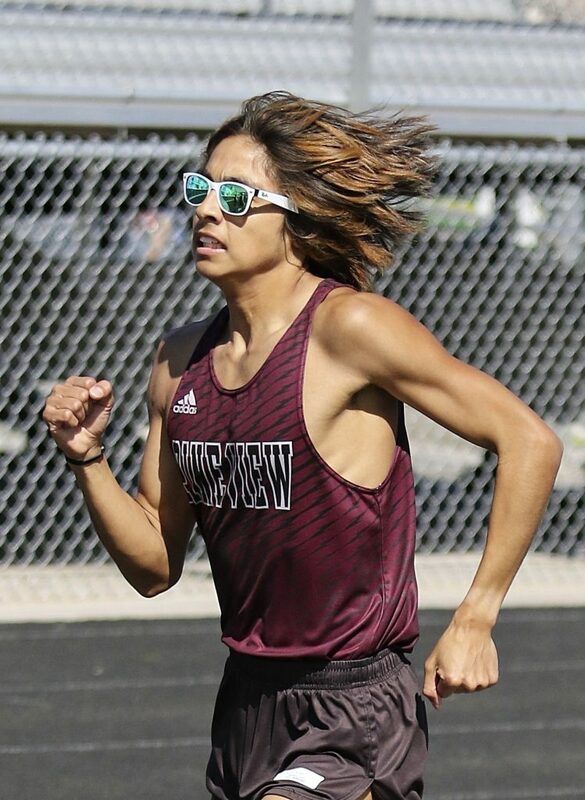 Britt Dunnell, a senior at Canyon View, was the top Region 9 finisher in the 400-meter race, taking second with a time of 51.19. Finishing ahead of Dunnell was Skyridge’s Josh Taylor, who set a new meet record with a time of 49.74. Bailey Oswald of Cedar took third in the 800-meter run, finishing in 1:59.22. The Canyon View boys placed first in the 4×400 meter relay, posting a time of 3:28.10, best among 4A teams in the state so far this season. 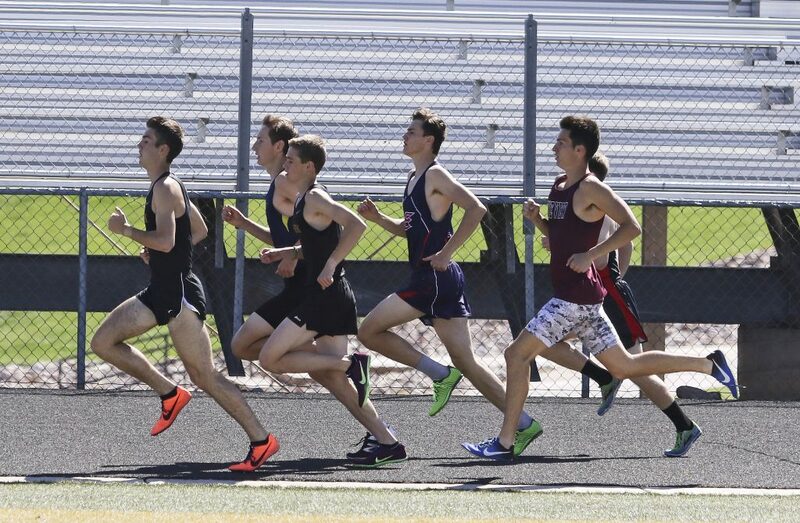 Pine View’s boys won both the 4×100 relay and the sprint medley events. 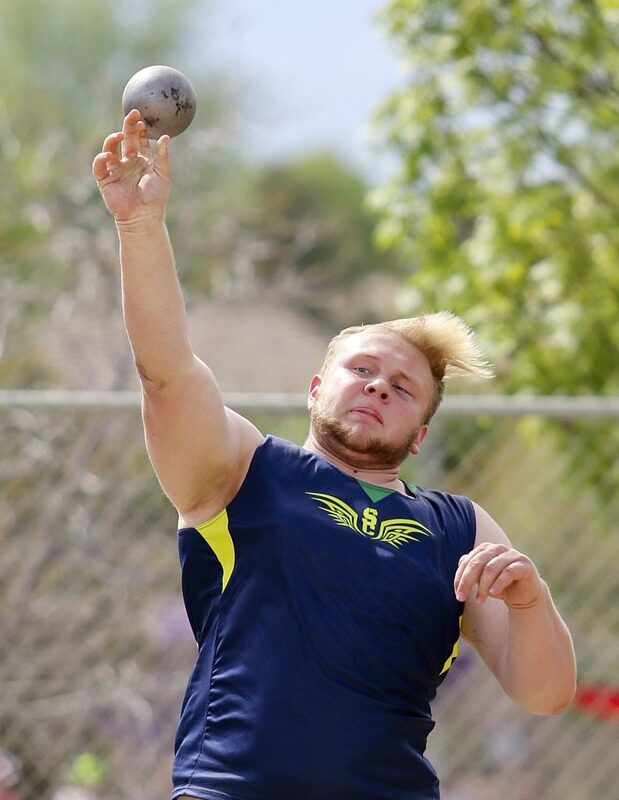 In field events, Brock Nowatzke, a junior at Snow Canyon, won the shot put with a throw measuring 48 feet, 1.5 inches. 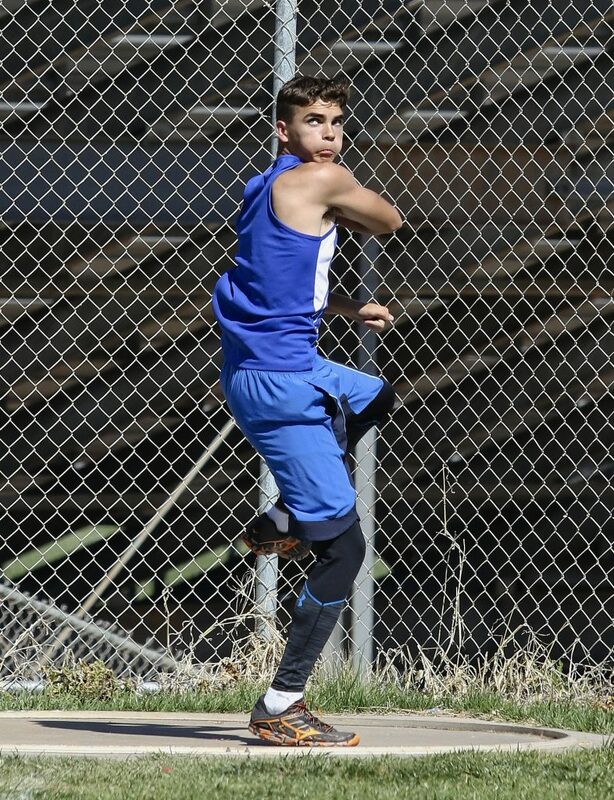 Cedar High senior Drake Fakahua was second with a mark of 47 feet, 6 inches. 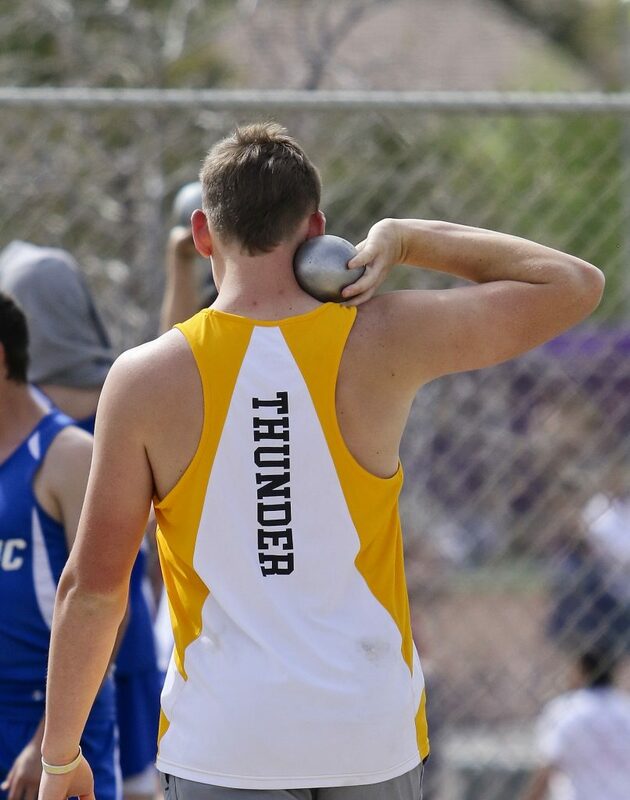 Ryan Warner of Desert Hills won the discus with a throw of 154 feet, 8 inches. Justin Weidauer of Dixie was second with 148 feet, 6 inches. 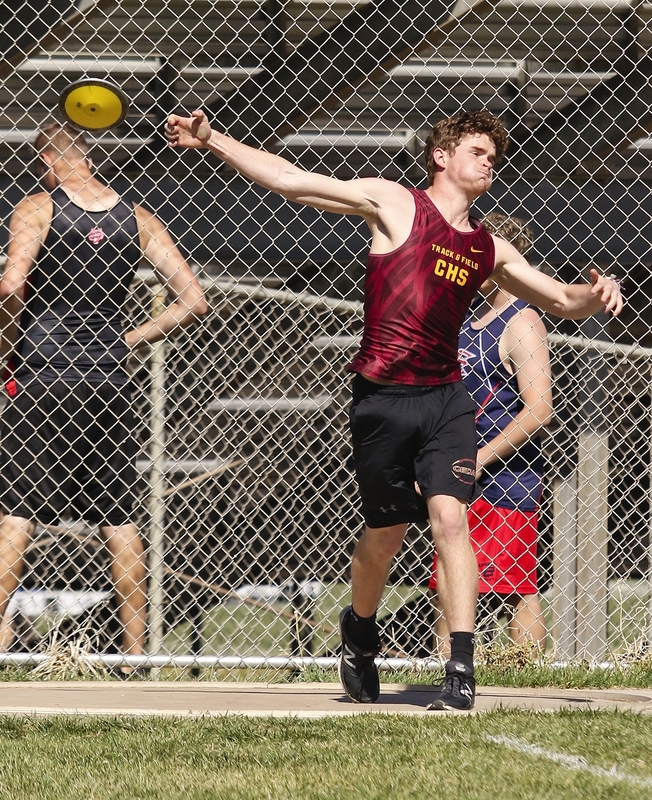 In the javelin, Canyon View senior Jake Nelson won with a top throw of 177 feet, 5 inches, second best among 4A athletes this year. 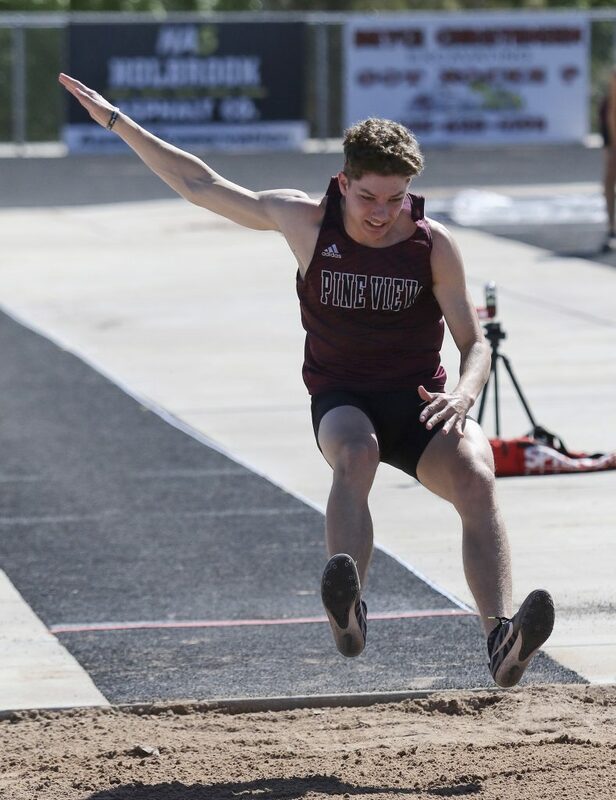 Nelson also took second in the long jump with a leap of 20 feet, 3 inches, while Pine View’s Jaron Woodruff placed third in that event with a leap measuring 20 feet, 1 inch. Ammon Smith of Desert Hills won the high jump by clearing 6 feet, 2 inches. Also clearing that height was runner-up Kyler Coleman of Dixie. Smith also placed third in the long jump. 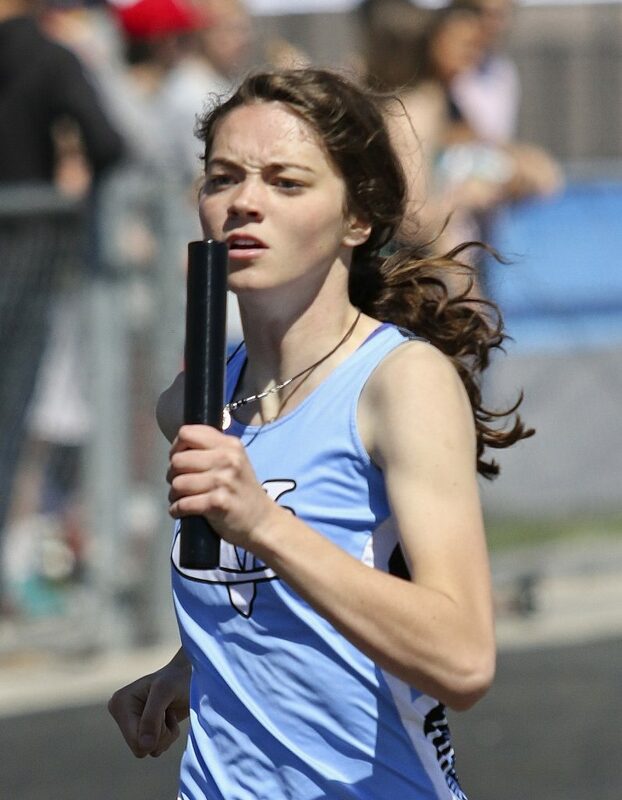 This coming week, Pine View hosts the Panther Relays, a relay-only meet, on Tuesday, while Dixie High hosts its invitational meet on Friday and Saturday.